Turkey boasts two popular walking trails: the famous Lycian Way and the Saint Paul Trail. This year the Carian trail has been added to the list, a long distance trail of 800 kilometres linking antiquated towns. 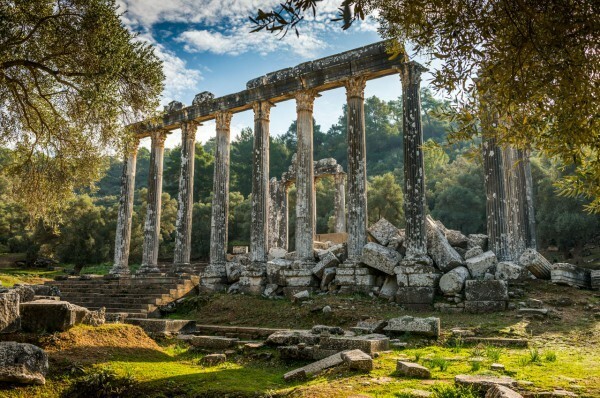 The Carian trail runs via centuries-old trade routes and shepherding tracks, along the coastal bays of the Mediterranean, and through traditional mountain villages into the wilderness beyond. This is far beyond the tourist packed towns like Bodrum and Marmaris; mass tourism knows very little of the coastal region. The Carian Trail is Turkey’s best kept secret. The trip: A five day coastal walk on the Bozburun peninsula. A five day trekking tour through the Latmus mountains. The route follows old mule trails, trade routes and shepherding paths. These have no steep climbs. In some areas the countryside is stony with thorn bushes. Navigation: The Carian Trail is well signposted with the standard long distance path markers of red and white stripes on boulders and trees. There are no dependable official maps, but the Carian Trail book has a number of good route maps. Sleeping arrangements: We are presently working hard at setting up a network of hotels, hostels and homestays en route. On our described routes it is always possible to follow the trail without needing to set up camp. Those who prefer to camp are able to set up their tents in whichever area of countryside they choose, and upon enquiry will find that all villages are happy to welcome you. The Agora Pansiyon in Heraclea is highly recommended for those who appreciate gourmet meals. Their wide range of breakfast choices and the multiple-course evening meal are sublime. Best season: March to May. September to November. It is still possible to follow the coastal trails during the winter months, but can often rain. Flights to Turkey: Turkish Airlines fly daily from almost anywhere via Istanbul, to the airports of Dalaman or Bodrum/Milas. As from this year all tourist visas must be ordered online via credit card. A three month visa costs $20. For more information: www.evisa.gov.tr. 1 Euro = YTL 2.77 (January 2016). Cash machines for bank and credit cards can be found at the airport and larger public areas. Take enough Turkish Lira, especially smaller notes, as paying by card is not possible in smaller towns. Whoever walks through Turkey will be invited for tea on at least a few occasions. You could also be invited to a wedding, a meal, a night’s accommodation or even a circumcision. There are a few unwritten rules that you should appreciate. Always remove your shoes at the front door (you’ll sometimes be offered slippers). Traditionally, women do not shake hands with men. A friendly smile followed by ‘Merhaba’ (hello) does wonders. When entering a village make sure you wear long trousers (and, of course, a shirt). If your hosts seem relatively poor you can always offer a small gift such as a packet of biscuits, chocolate or other luxury foodstuffs. 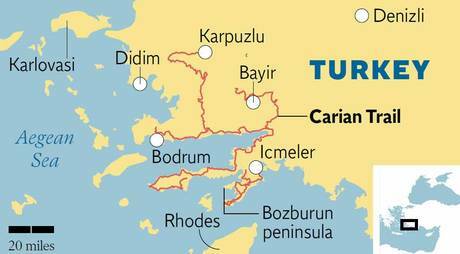 Travelogue for the Carian Trail walking route. A white-bearded man comes out of the woods, bent under a heavy load of wood, followed by his wife who is similarly carrying a bundle of branches. Ruddy cheeks and mischievous eyes stare at me. “Kahvalti?” he asks. Time for breakfast. I find myself together with the founders of the ‘Carial Trail’, in a plastic tent in the woods of the Bozburun peninsula. Tour guides began their search of the ancient trails in 2007 which link together the mountains and history of ancient, classical Caria. As the old man lit the bread oven, Our Guide tells us how he found these paths. “Most of these paths were used by shepherds. Since the present youth seem to have no interest in goats and mountain walks we had to look for old men in tea-houses. This lead to some confusion. Why would these strangers want to know the old pathways? Are they planning on smuggling refugees to the Greek islands, or to rob our archaeological sites?” Our Guide laughs. “The locals didn’t understand that people walk for pleasure. There’s a bus, isn’t there?” Guide Nuri adds: “We were even stopped a few times because the villagers thought we had come to steal their livestock during the Sacrifice Feast.” The smell of fresh bread makes my mouth water. Mehmet, The old boss, puts our breakfast on the table. “Bon appetit, lads! Cheese from my cow, olives from the neighbors, honey from the woods and eggs still warm when I collected them this morning. You can walk for the whole day on this”. The path clambers over boulders through the woods where we suddenly come across the ruins of a Byzantine church facing the Mediterranean sea. “The entire coast is a tourist attraction with resort centers such as Bodrum and Marmaris, or for the thousands of visitors coming here for a ‘Blue Cruise’ on traditional gulet sailboats” Mehmet tells us. “But go a hundred meters inland and you’re in beekeeper and shepherd territory, other than them you have the whole area to yourself. Mehmet is easy to spot within our natural surroundings, his pants are covered with red and white paint splatters and even the GPS has enjoyed a custom paint job. “You should have seen the car when we finished marking the trail last year. The interior was a write-off”. The view toward the bay below us is spectacular. With the sun above the island, the clouds on the horizon seem extra dark. We don’t want to walk further in case these clouds decide to produce a downpour. The waterspout which tried to slowly empty the ocean disappears as quickly as it appeared. I stumble over a large stone and as I look around see deep grooves and guttering. “That was probably an olive press,” Mehmet observes. As I continue walking I realized I have stumbled over a 2000 year old piece of heritage. This is what makes hiking on the Carian Trail so interesting. Wherever you walk, ancient civilizations have lived, and proof of their existence is still visible today, from millstones to complete ancient towns. All roads lead to Rome; this one-liner can also apply to the village of Bayir. Centrally placed on a high plain, with an ample supply of spring water, the trail passes twice through this village. It was the Greek god Asclepius’ son who founded the village and married the daughter of the Carian King. On this central plain beside the mosque there still lie a number of stones inscribed with texts from 200BC, leading us to believe that the mosque has been built upon the original temple of Asclepius. The path to Taşlıca rambles through a wilderness of bleached limestone, rust-coloured earth and, mainly, lots of thorn bushes. “This part of the trail is literally made with blood, sweat and tears.” Guide smiles. “I had to chop my way through these thorns five times before I found the trail. On one occasion we found a man who had once been a shepherd here, and was willing to help. But by noon we realized that he was an alcoholic. By the time we had finished a litre of water, he’d had a bottle of liquor…and the trail? We found it on our own.” We startle a group of wild horses. They stare at us, before heading off at a gallop, manes fluttering, deep into no man’s land. The men from the tea house in Taşlıca look up, similarly startled, from their daily chat as a group of colorful hikers walk into their village. The strong, aromatic Turkish tea, served in small glasses, reloads our batteries. Time has stood still here. Horses, mules and donkeys are the most common forms of transport. The scent of trampled wild thyme and oregano tickle my nose as we suddenly stand before a large stone wall. I follow Altay through a hole to enter a film set straight from Indiana Jones. A scene of ancient buildings, overgrown with trees and bushes. “Welcome to Hydas” he shouts triumphantly as we stand above the town, with a phenomenal view over the bay. “This ancient town from the Hellenistic period has not been dug by archaeologists yet, everything looks exactly as it was more than a thousand years ago.” The sun slowly falls through the clouds toward the sea and throws golden beams over the horizon. We could not have wished for a more beautiful goodbye to Bozburun. The ruins of Labranda mark out the beginning of the second part of the route through the Latmus mountains. We don’t come across any tourists here. Ali and his wife Emine are the gatekeepers of Labranda, and live in a small house set between the ruins. Ali proudly shows us a photograph of his father assisting with the archaeological dig. “Are you hungry?” he asks. We know that Turkish culture demands hospitality, so we politely decline. “Come on, you have to eat!” he says, slightly affronted. We politely decline a second time. If he now offers again, it is a genuine offer, and if we refuse again, we really don’t want to. This seems quite laborious, but in a culture seeded by the nomads, hospitality to strangers was a survival strategy. But not everyone can afford to cook for others, and therefore a guest should always refuse a first time as a show of good manners. But we were hungry, and he had food. So shortly after his third offer we were sitting in this antiquated setting at a wobbly table full of goodies, as if we were Carian royalty. The countryside here is dominated by pine trees and olive groves on sharp inclines. The mule trails, paved with enormous flat stones, are still intact in places. Here and there the route crosses a settlement, up till recently only reachable via these trails. I imagine that, while working at paving this road, the inhabitants finally found a way out and left their houses behind. Most of the houses here are empty. The lavender is in full bloom, but this wild species does not seem to be as potent as its commercially grown sister. Sarikaya is another village easy to fall in love with, and I also understand Mustafa, who after completing his career in the police force returned to the mountains. As we passed his house he offered us tea, and now we are enjoying a large meal. Mustafa and his wife live on a small state pension, but have their own dairy cow, olive grove and orchard. Everything on the table is fresh: two sorts of olives, spinach with garlic in yoghurt, honey, artichoke hearts, fried eggs swimming in fresh butter – we are happy as Larry. In an abandoned cemetery above the village lies Ayse who, at 647 years old, must have been the oldest women in the world. Our Guide laughs at my observation. “She was born in 1337 in the Ottoman Empire, which still used the Islamic calendar, and died in 1984 in the Turkish republic, founded by Ataturk and adopting the western systems such as the Gregorian calendar and Latin script.” After this ‘Back to the Future’ moment, I realise the further we go into the mountains, the further back in time we travel. In Ketendere we drink even more tea with the old men; women don’t come here. Each of them have weathered faces and callused hands. Mountain life is not for the weak. Opposite the tea house, smoke pours from a barn. I take a look and find a traveling tinker crouched over a fire. With a cloth he polishes molten tin powder onto a copper pot, which once again sparkles like new. In a village where they produce large quantities of cheese and yoghurt this is important, which is why he comes here for a month every year in the spring, working on all the village pots and pans one by one. Fatima lives in the most beautiful house in Çomakdağ. She’s in her 80s, but can still climb the ladder into her historical house with dexterity. The fact that the original stairs have been removed because cars can’t make the corner, doesn’t bother her. Çomakdağ is well known for its colourful interiors and the women’s habit of adding flowers to their headscarves. She proudly lets us see her house. When I mention Labranda I can see her eyes light up. “That used to be our summer meadow for the livestock. We would always go there on holidays for a picnic, but the government has taken it all away. Now it’s a museum”. She tells us more about the times when large camel caravans used our route to get to the Silk Road toward central Anatolia. She could go on for hours, but we have to go on. Ancient Heraclea was an important port in the Gulf of Latmus before it silted up, and is now an hour’s drive from the beach. After first prayers at the mosque, cows are led to the grassy meadows as we enjoy a farmer’s breakfast on the terrace of the Angora Pansion – the prize-winner of this trip. The villagers live in a kind of open air museum, and I would love to stay here for a few days. It is as if the entire area has been sprinkled with house-high red-brown gravel. In such a landscape you really could crawl under a rock and never be found. The Byzantine monks must have thought much the same when they settled here for monastery life. High in the mountains above Heraclea I find out that the monks were not the first inhabitants. Under a kind of large, collapsing dolmen Altay points to the ceiling. “These rock paintings come from Neolithic times, 8000BC. They have found many paintings, but not all of them by a long shot. It’s because the terrain is so difficult”. The monks thought it a good idea to paint frescos under overhanging rocks at the monastery, where they could sit in the shadow during the hottest part of the day. We jump from boulder to boulder in this geological playground. Altay tells us of his plans: “If everyone agrees, hikers van make their way from village to village next year, and stay in the villager’s homes. That way the villagers can also benefit from tourism. What we eventually hope to arrange is a luggage service, so you can walk unencumbered by baggage, but still have everything you need upon arrival at your evening’s accommodation.” The view is fantastic, with the Bafa lake in the distance, a light breeze whistles through high grass where bees sip at nectar with a monotone buzz. In the distance a dog howls along to the midday prayers, and is answered by a choir of braying donkeys. I close my eyes under an olive tree, and allow myself to be gently carried into the rhythm of the Carian Trail.